In early September, the State Auditor's Office released the City of Lynnwood's Annual Audit Report. The report included audits of the City’s 2016 Financial Statements, Federal Single Audit and Accountability Audit. The State Auditor found that the City was in compliance with all accounting principles, laws, regulations, contracts, grant agreements and internal controls, and there were no findings issued. 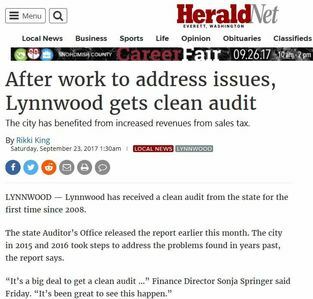 This is the first time since 2008 that the City of Lynnwood has received a clean audit. Incorporated in 1959, Lynnwood is the economic hub of South Snohomish County. Situated at the convergence of interstates I- 5 and I-405, Lynnwood’s accessibility, variety of housing and employment options, colleges and outstanding park system attract a wide variety of businesses and residents. For its diverse population of more than 36,000, Lynnwood is a great place to live, work and play. 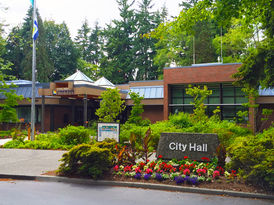 Lynnwood Moving Forward: Our Community Vision – the City will be a regional model for a sustainable, vibrant community with engaged citizens and accountable government. Lynnwood is…a great deal more!